Lemons! Just seeing these bright yellow beauties puts me in a happy mood. This time of year we’re all about the citrus in our home. 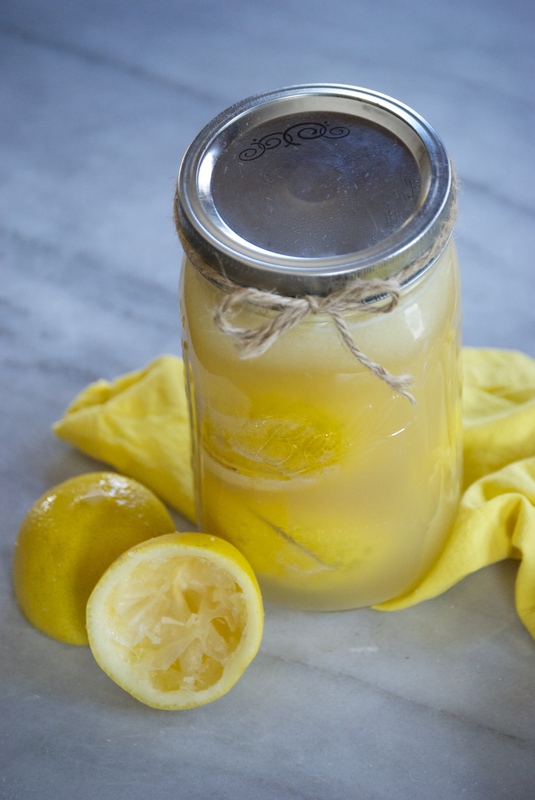 And though I know I’ve already shared a preserved lemon recipe here previously, I like having options, so I thought I’d share this one with you, as well. You see, this is the version that I tend to make more often. The other one is lovely, don’t get me wrong. It’s especially delightful when you make impressive Moroccan food. But, often I find that a simpler, dare I say “plain” version, such as this one is more versatile. 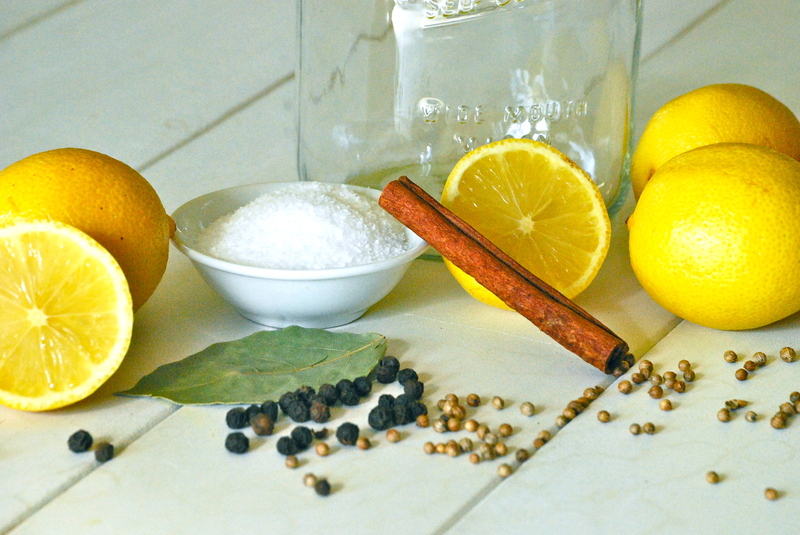 This preserved lemon recipe works with everything! Plus, it takes about 5 minutes of work for a result that can be enjoyed for the entire next year. I think we’re winning here, friends. Ok. You want one other important little tidbit as to why I make this version more often? It’s to do with my husband. As I mentioned before, he fancies himself a bit of a mixologist, and he makes a cocktail called The Corsair that uses the juice from preserved lemons in it. It’s citrusy, salty heaven. So, for that reason alone, I make this plain version. I’ll share the recipe for the cocktail once the weather warms a bit. I don’t pack quite as many lemons into the jar, and instead pour more fresh juice into it. You can certainly pack that thing tightly so you get as many fresh lemons in there as possible. Of course, if you want to start experimenting with cocktails made with salty preserved lemon juice, you know what to do. 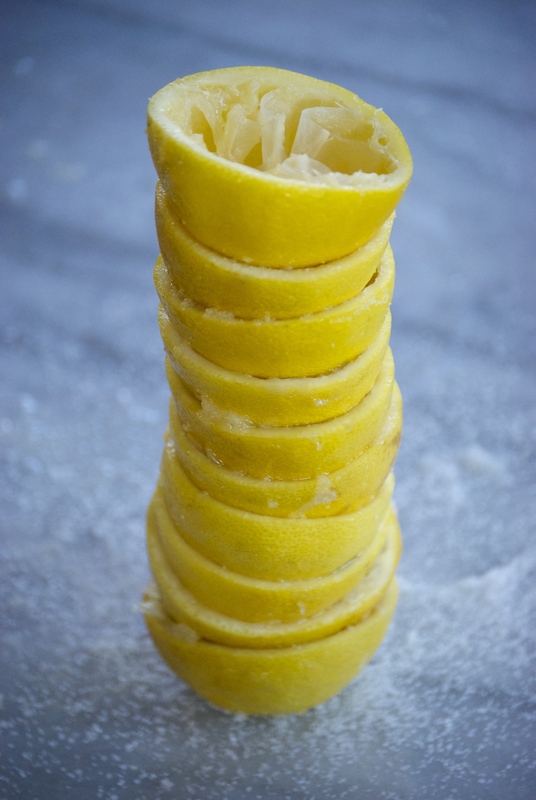 Now even though you may not be thinking of using preserved lemons, now is the time to make them. It is, in fact, citrus season. Not only will you get lemons at a good price, but they’ll have the most flavor. Buy organic lemons, as they are not covered in wax. However, if you can’t get organic lemons in your neighborhood, just make sure to wash them thoroughly to remove the waxy film that may be on them. 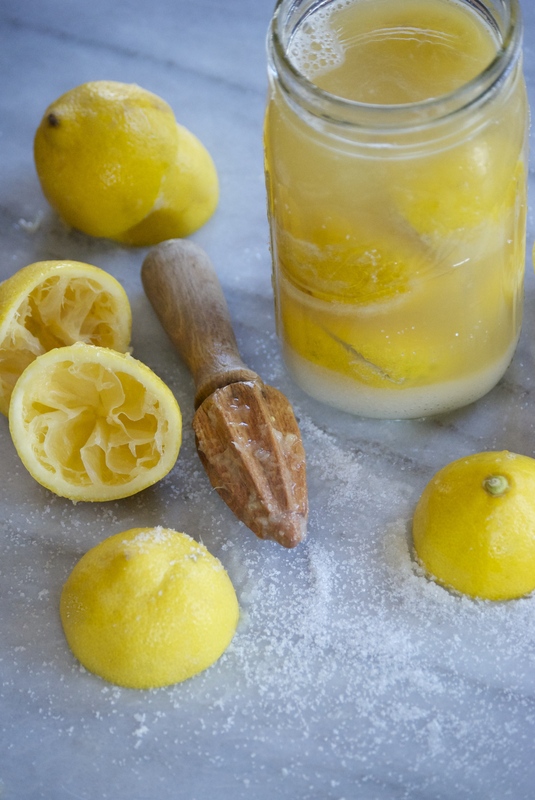 Preserved lemons can last for up to a year in your refrigerator. They are a wonderful bright addition to braised meats, chicken, grain salads, or just about anything that could use a little oomph! You only use the peel part of the lemon, not the pulpy inside. And generally it is a good idea to give it a rinse to remove the excess salt. Wash the lemons well. Add 2 tablespoons of sea or kosher salt to the bottom of a clean quart jar. Cut an “X” on one lemon end until about 3/4 of the way down. 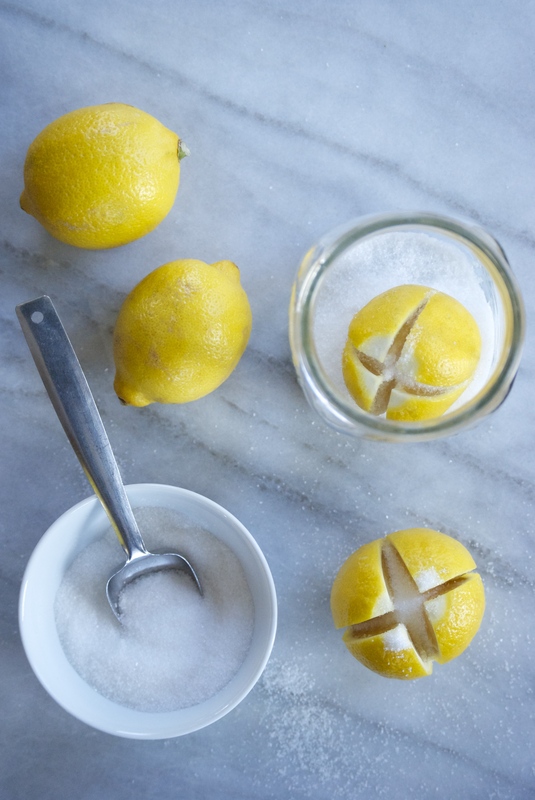 Repeat for as many lemons as will fit into your jar. Fill the opening with salt (about 1 tablespoon) and place into the jar. Squish as many as you can into the jar and gently squeeze juice out of the lemons as you do this. 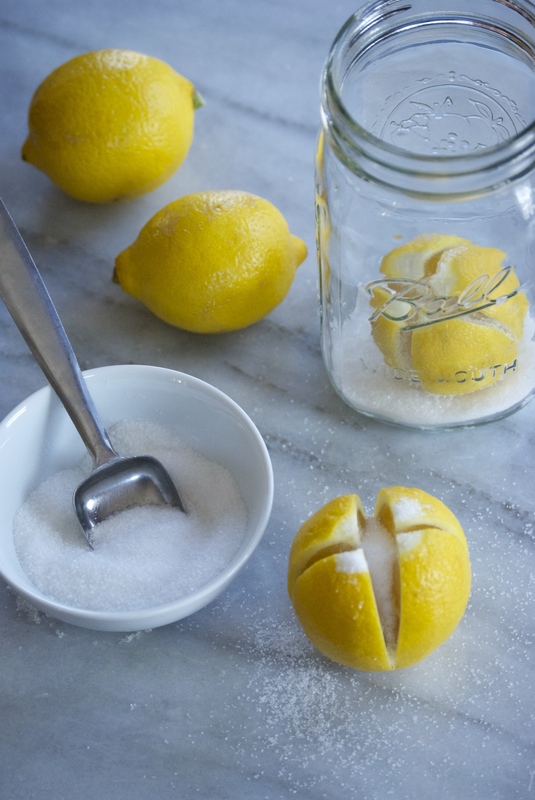 When the jar is full of lemons, add lemon juice from the remaining lemons until it reaches the top of the jar. Place the lid on the top and gently turn the jar back and forth to incorporate the salt on the bottom. Keep the jar on the counter for about 3-4 weeks, turning it every so often. Then refrigerate after that for up to a year. 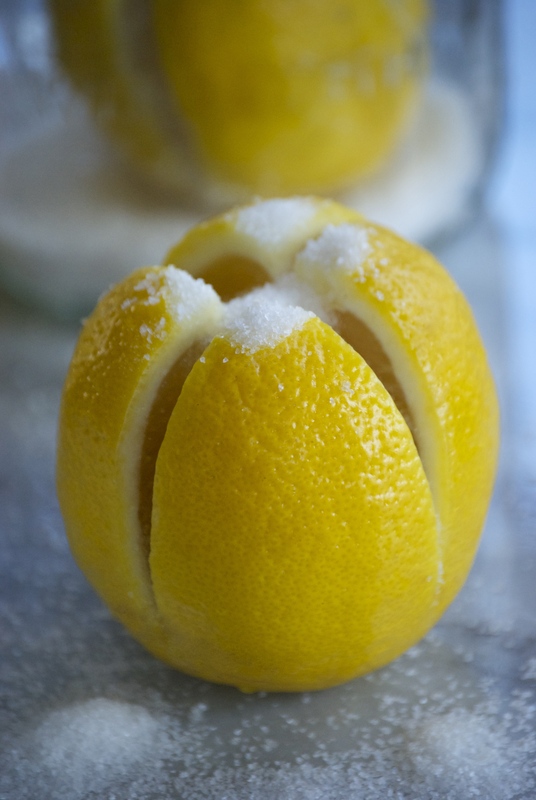 Use clean tools to remove the preserved lemons when wanting to use some. Rinse off the excess salt when incorporating it into meals. Enjoy! So now that school is out, I’m trying to get my bearings straight. We are four days into summer vacation, and while I am more than thrilled to have my son home all day long, it’s not without its…complications. Aanen has this amazing contagious personality– he is truly a joy to be around. He and his sister get along swimmingly. And I love not having to pack his lunch every morning and rush him off to school. Mornings around our house are brilliant. However…it’s the rest of the day that gets a bit more hectic. We’re I’m missing my schedule. I knew exactly how much I could squeeze into a day and how much I could get done. Now play dates, outings, parks, and pools have all taken its place. And though I absolutely love all of these things, it’s hard to get any real work done. I know I’m not unique in this situation or these feelings, but it sure feels good to ramble on about it. So how does that tie-in to today’s post? Well, in the hustle and bustle of our summers we tend to eat much simpler food. It’s easy to do with all of the fresh produce, so I’m absolutely fine with it. I’ll often make a huge salad or two at the beginning of the week from legumes and grains and we’ll nibble on it for a few days. It works well when we’re constantly running out the door. This salad in particular keeps well. And it’s absolutely perfect to pack for picnics. I’ve always been a fan of chickpeas. They’re loaded with protein, and they’re substantial enough to turn a salad into a meal. 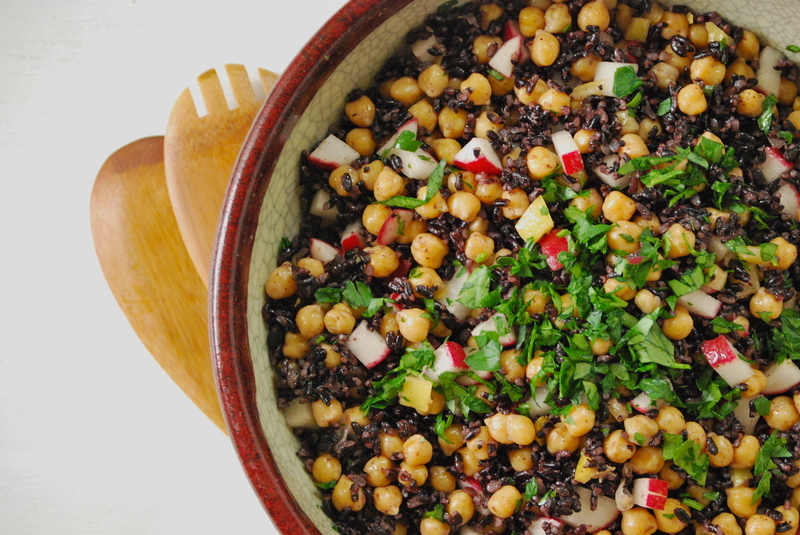 If you’re not familiar with black rice, give it a chance. Here’s a previous dish that I made using it. 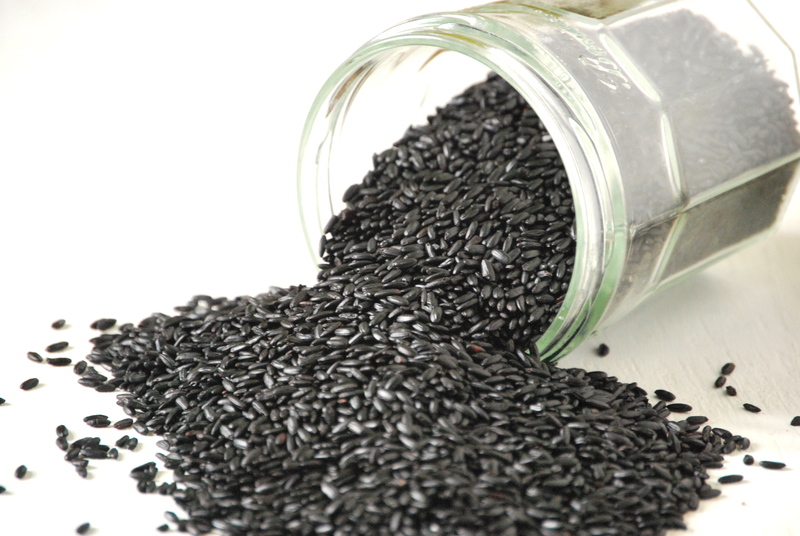 I love black rice, sometimes called “forbidden rice”. It’s nutty and similar in taste to wild rice. It’s loaded with antioxidants, vitamins, minerals, and fiber. You can read more about it here. 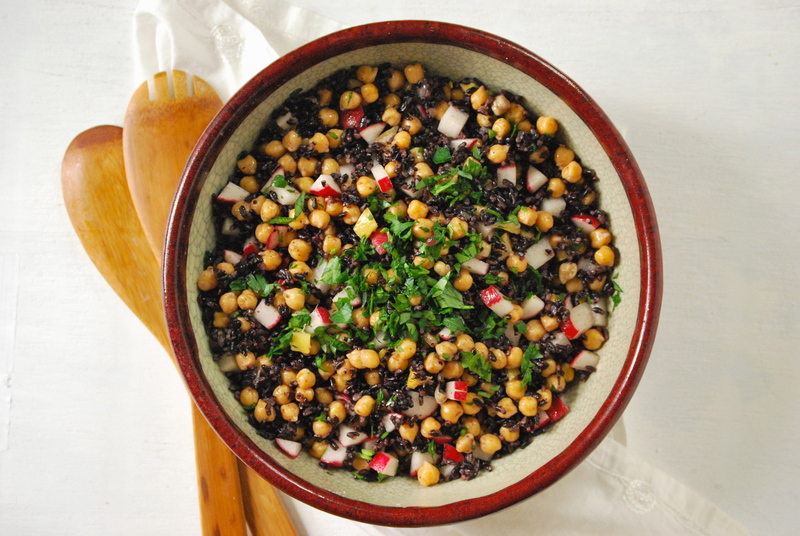 I realize that some of you may not the able to find black rice and that’s ok. Quinoa is also a wonderful substitute and is loaded with its own health benefits. 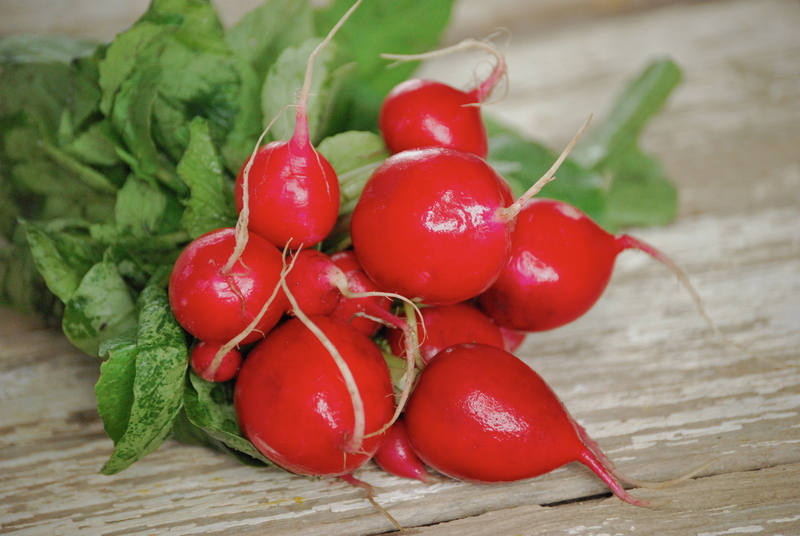 Radishes give this meal a nice little crunch and they are so wonderful this time of year. The preserved lemon adds a burst of brightness that makes you smile every time you bite into a tiny piece. If you haven’t made preserved lemons yet, do it now. They add so much to summer salads. Here’s a recipe from my blog. Or you can do the salt pack method, which is how I made this last batch. This is a recipe for that method. Obviously, if you don’t have preserved lemons on hand, you should still give this salad a try. The parsley and subtle shallot vinaigrette bring all of the flavor together and I love the fact that it’s so healthy! Makes me feel better about all of the ice cream that my kids are devouring. Hope you enjoy! Note: To cook dried chickpeas, place in a large saucepan covered with cold, salted water. Bring to a boil. Let boil for a few minutes. Cover and turn off the heat. Let sit for 1-2 hours. Bring to a boil again and cook for a few more minutes until they are your desired tenderness. To make the black rice, place in a large saucepan and cover with cold, salted water by a couple inches. Bring to a boil, then reduce heat just a bit. Let cook until the rice is tender (about 25 minutes). Drain the water. To make the Shallot Vinaigrette: Place the chopped shallot in a bowl, or jar, and sprinkle with a little salt. Pour the vinegar and lemon juice on top and let soften for about 15 minutes. Then whisk in the olive oil, or give the jar a shake. Season to taste with salt and pepper. Place in the refrigerator, let it warm up for a few minutes before you plan to use it. 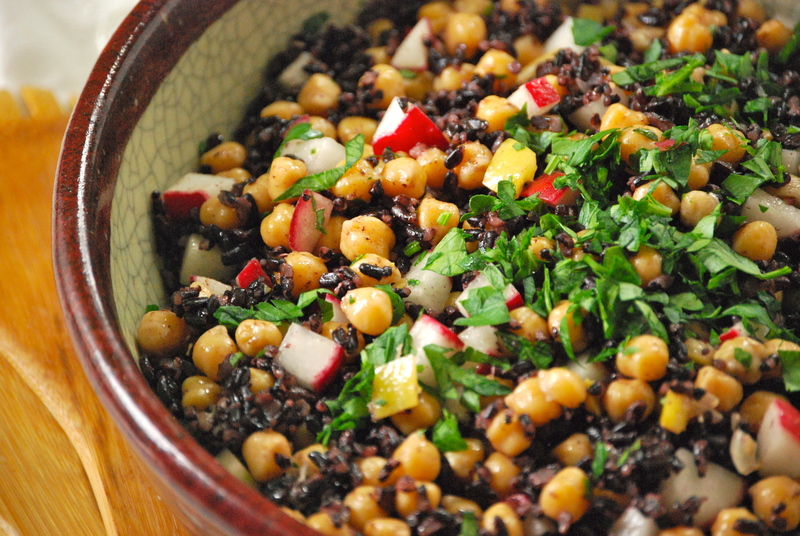 Place the rice and chickpeas into a large serving bowl along with the parsley, radishes, and preserved lemon. Pour as much dressing over the salad as you like. Start with a little and add more, you will not need to use the entire amount that you made. Toss the ingredients together and let the flavors meld for a bit. You can even refrigerate it and let it warm a bit before serving. This salad will keep well for days. Enjoy! Here’s a recipe to make now and set aside for a month or so. It’ll be ready for you (and you for it, trust me) once the holidays have passed. Chances are you won’t want to think of another heavy meal or of holiday sweets by then, so these preserved lemons are a perfect addition to lighter fare. Preserved lemons have a wonderfully pickled flavor and silky texture. While they’re often found in Moroccan and Middle Eastern cooking, they’re so versitile that you can use them in most anything. Officially, these little gems should be ready to use in about four weeks (though, I usually never wait quite that long). Even better, since preserved lemons cost a fair amount at the market, when you make these at home you’ll not only get better flavors, but you’ll save money. The entire lemon is used– rind and all. Here are a few ideas for using their wonderful zing to brighten up your typtical meals. They are wonderful finely chopped and mixed into sautéed vegetables, like green beans. Mix them into couscous or rice and create a wonderful side dish. Or, add thin strips to meats that are braising during the last few minutes of cooking. They also pair wonderfully with roasted chicken or chicken salad, and are amazing with steamed fish. You can even put them on a pizza with chicken and arugula for a change of pace. 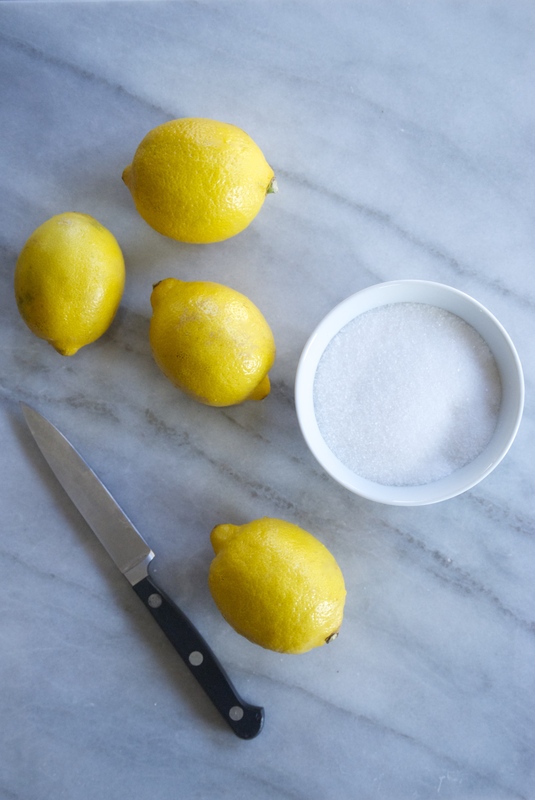 However you choose to use them, make sure to not over-salt the original dish as the lemons will add a fair amount. You may see a white substance develop on the lemons, but don’t be concerned. This film is normal, and should simply be rinsed off with cool water. Another thing to keep in mind is to use kosher or sea salt– table salt can add a harsh chemical flavor. While I have yet to try it, I’ve read that the liquid the lemons are preserved in makes wonderful cocktails. Bloody Mary, anyone? Plan ahead and make these lemons now– by mid-January with its Winter darkness, they’ll be ready to brighten your meals. Bring 2-3 quarts of water to a boil in a large saucepan. Add the lemons and simmer for about 4 minutes to soften the skin. Drain and rinse in cold water. Pack tightly into a sterilized quart jar. You may need to cut them into halves or quarter to fit them all in. 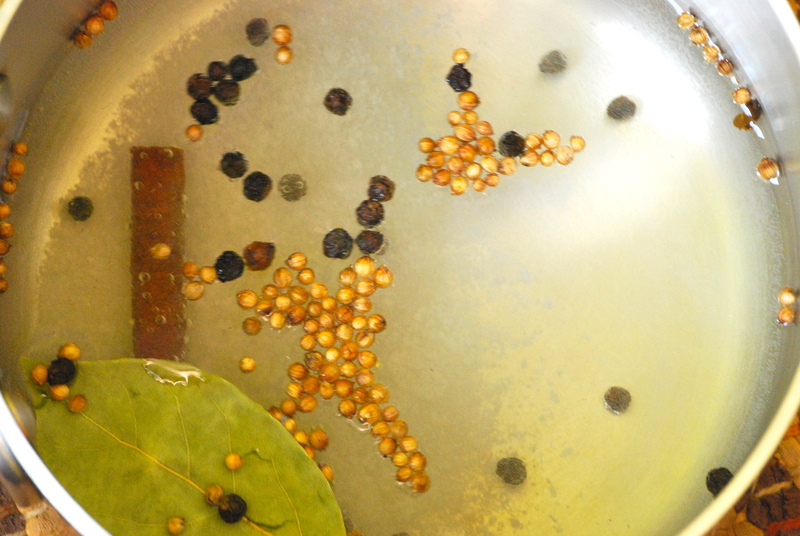 In a small saucepan, combine the 2 cups of water, salt, cinnamon stick, peppercorns, coriander, and bay leaf together and bring to a boil. Cool slightly. Pour brine over the lemons and cover completely. You will probably have brine leftover. Coat the surface with olive oil and screw on the lid. Age the lemons for about 4 weeks in a cool, dark spot. Always use clean tongs or a fork (not your fingers) to remove the citrus from the jar. Taste a piece and rinse under cool water if it seems too salty. Refrigerate after opening. Preserved lemons can be kept for up to a year, or more. As always, I love your company. Thanks so much for stopping by.